EVENT MARKETER: WHY BRANDS ARE MAKING MORE CONNECTIONS WITH MAIN STREET U.S.A.
As event marketers slice and dice their target audiences into ever smaller and more meaningful groups, their activation strategies get smaller and more meaningful, too. As a result, community-level event programs are gaining momentum as both standalone programs and spinoffs of larger efforts, but with a homegrown twist. Benjamin Moore painted the town red (literally, in some cases) with a revitalization effort that put its products in just the right context. The USGA transformed its members-only U.S. Open experience into a community affair. And Pepsi surprised and delighted an entire small town as a lead up to its Super Bowl activations. Here, a closer look at each program—and the communities that loved them. When residents and community leaders of Sea Bright, NJ, gathered on May 17 to celebrate the freshly painted storefronts along Ocean Avenue, they were among the latest of 20 cities to benefit from Benjamin Moore’s Main Street Matters campaign. Main Street Matters is the paint manufacturer’s largest effort to date to revitalize communities across North America. The program kicked off in May in conjunction with Make It Right, a long-time partner of Benjamin Moore that was founded by Brad Pitt, who lent his voice to the campaign. A call for communities across North America to nominate their town resulted in hundreds of submissions. The entries were vetted and narrowed down to 144 communities. Online voting at paintwhatmatters.com and paintwhatmatters.ca determined the final 20 towns. Benjamin Moore provides paint and supplies for façades, porches, railings, shutters and other exterior trims to cover approximately three blocks of each town’s Main Street. Its color experts consult on the best choices to enhance the architectural style, regional influences and historic preferences of each community. Local Benjamin Moore retailers and field reps identify painters, photographers, carpenters and electricians from the community. Painting began last fall in Nyack, NY, then continued in January in Hilo, HA. By this June, 15 Main Streets were completed. The program will relaunch in September with consumer nominations for another 20 Main Streets to be repainted next year. Golf is a sport long associated with money, exclusivity and, yes, the ability to drive a little white dimpled ball hundreds of yards into a tiny cup at the end of a fairway. To widen the perception of the sport beyond that country club image, the U.S. Golf Association activated programs outside of the prestigious Pinehurst Resort, where the U.S. Open Championship took place during two weeks in June, to connect with the local community. “We basically thought of it as, there is all this great stuff that happens inside the gates, but what are we doing beyond the gates? What if we broadened that out and thought of this as something that could reach out into the community, to have people dip their toes into the golf universe,” said Dave Aznavarian, senior director-marketing at the USGA. About a month in advance of the Championships, the USGA took its prized trophy on the road with “The Drive to Pinehurst,” a tour that traveled to three North Carolina locations—Jamestown, Pinehurst and Raleigh—to film vignettes of three people with a golf connection. And no, these weren’t your typical guys in khaki pants and polo shirts, but rather a seven-year-old up-and coming golfer, a 17-year-old girl and an older gentleman who had played in 11 USGA championships. It visited each of their hometowns to film the footage, which lives on usga.org and was posted on Facebook and Twitter. 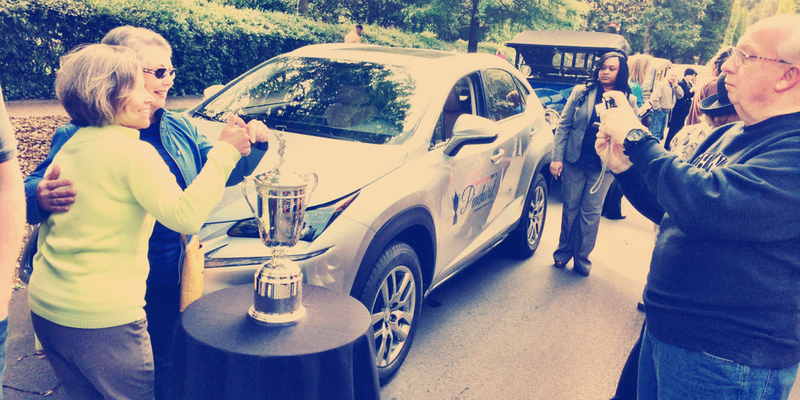 It did media stops along the way and even hit a local Concours d’Elegance where a USGA spokesperson talked about the trophy and the upcoming Pinehurst event. Each year in a private ceremony the USGA recognizes an individual with the Bob Jones Award for sportsmanship, integrity and respect for the game. This year, however, it expanded the program beyond the on-course event for VIPs and ticket holders via a live stream on usga.org and in the village of Pinehurst where the USGA had erected its “Open for All” fan experience. The U.S. Open Open for All Experience, which was located about a mile outside of the Pinehurst Resort gates, offered free events on a 40-foot by 60-foot live performance stage, a nine-foot by 12-foot LED board that showed live action and highlights from each of the championships, as well as local food vendors and a putting green. But the programs, which took place nearly every night over the two-week period, drew heavily on Pinehurst’s North Carolina connection. One night celebrated local military heroes; another offered a tribute to the state in which the mayor of Pinehurst and the governor of North Carolina spoke, followed by a performance by the North Carolina Symphony. Other evenings featured performances by bagpipers, a family and kids night and a tribute to Broadway by the Carolina Philharmonic (Agency: Momentum Worldwide, New York City).